This video is a follow up to a post that was written about the pool inspection process. It contained information about the specific findings at this particular Rancho Santa Fe pool inspection. This video was made so that customers in the San Diego County areas can see a little bit more about what we do, and what we can offer. 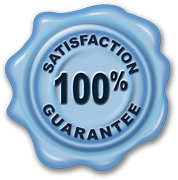 Everything Swimming Pools (license #974402) is a licensed swimming pool contractor that offers you everything you need, when you need it. This Rancho Sante Fe pool inspection video shows a small example of the various steps that we take with every job we perform. This pool had a few concerns. One problem we found at this Rancho Santa Fe pool inspection was that there was no expansion joint and that there were large structural cracks on the vanishing edge in the pebble finish. The other problems were with the pool equipment. There was a chlorine delivery system that was installed improperly that could cause harm. 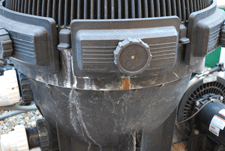 There was also a pool filter leak that needed to be addressed so it did not cause further damage. 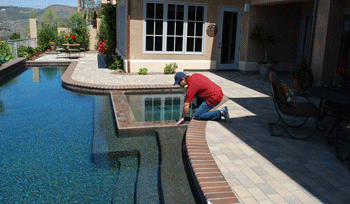 If you need a Rancho Santa Fe pool inspection or you live in another part of the San Diego area, we can help. Give us a call or fill out our contact form and we will give you a call.